This simple little project came about just this morning. You see, I might be losing my mind a little bit. There are countless examples. (Locking my keys in the car recently is one.) But last night I had another moment. As I was getting dinner ready, I was wondering why Adam wasn't home yet. We eat dinner at promptly 5:30 each evening or else Archer and Lyla go ballistic. They are often screaming at me to hurry up while I'm making dinner, so eating late isn't really an option. But Adam wasn't home at 5:30 so we started dinner without him. He usually calls if he's going to be late, but I hadn't gotten a call yet. So then I tried to wrack my brain and recall if he'd told me he was going to be late. I couldn't remember. When he finally got home, he reminded me he was getting a massage and I did vaguely recall him telling me that earlier in the week. So I decided I needed to have a better system for remembering what's going on in my life. I find myself having to hold lots of random information in my working memory these days. (...which kid has pooped, when I last let Jazzy outside, which days we're going to storytime, what time we're meeting up for a playdate, etc.) Adam suggested sharing his Google calendar with me. Now, this may make me seem like an old lady, but I just can't wrap my head around an electronic calendar. I suffered through using online calendars the last few years I taught and it worked out because I had a computer handy throughout most of the day. But now I mainly look at my phone and it's just too small for me to be able to look at a monthly view. I guess I'm just old fashioned and need a paper calendar. But I needed something even more intentional to help me keep track of what's going on. 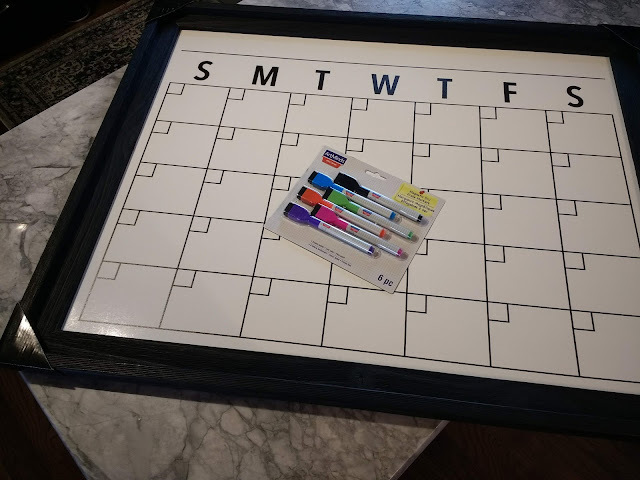 So I decided to get a large, dry erase calendar to hang up in our eat-in kitchen area. The kids and I headed off to Micheal's in search of the perfect piece. 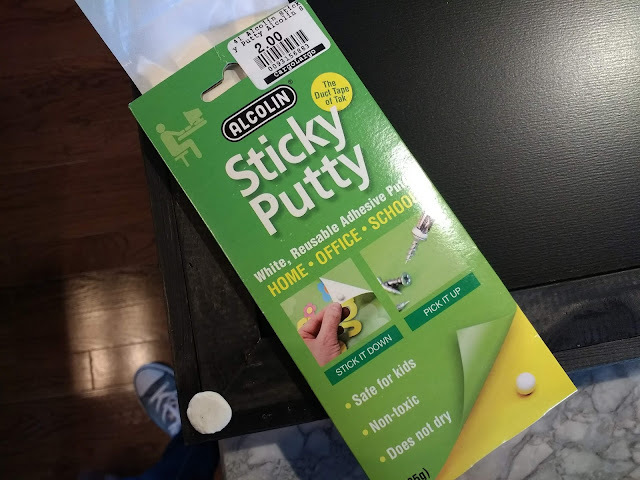 I definitely felt like a mom picking this up from Michael's today. They had a few to choose from, but I like this one for its simplicity. 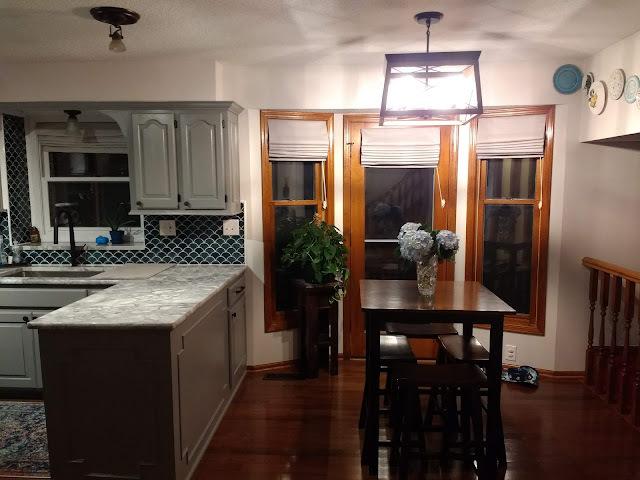 Plus, I thought the black would tie in with the other black features in our newly remodeled kitchen, like the cabinet hardware and the faucet. I also picked up some fine line dry erase markers. Luckily, the calendar was on sale for 50% off and I used a coupon on the markers. After wrangling the large calendar and two toddlers through Michael's and back to the car, we headed home to hang it up. We had a big open space right by our stairs that would be the perfect home for the new calendar. Some hooks that housed our keys and Jazzy's leash used to hang in that spot. 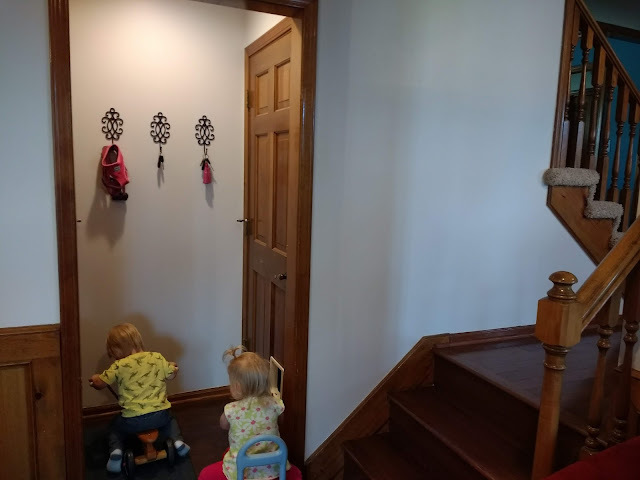 But after painting the walls, we moved those hooks closer to the door leading to the garage. We hung them higher there so the kids wouldn't mess with them. Moving the hooks left a nice opening for the new calendar to hang. 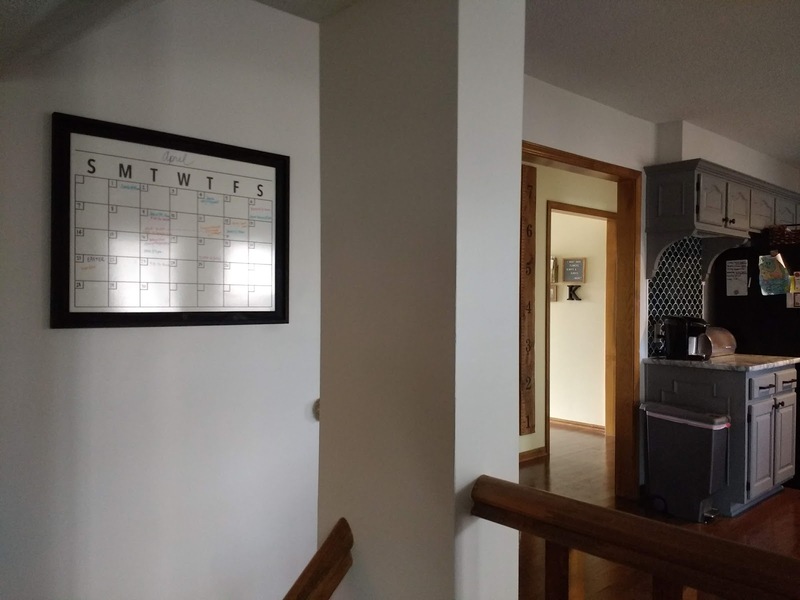 The calendar fills the space perfectly and is right in the heart of our home. So now I can easily glance at it to see what's going on each day. I plan to check in with Adam each Sunday to make sure I have everything jotted down for the week. 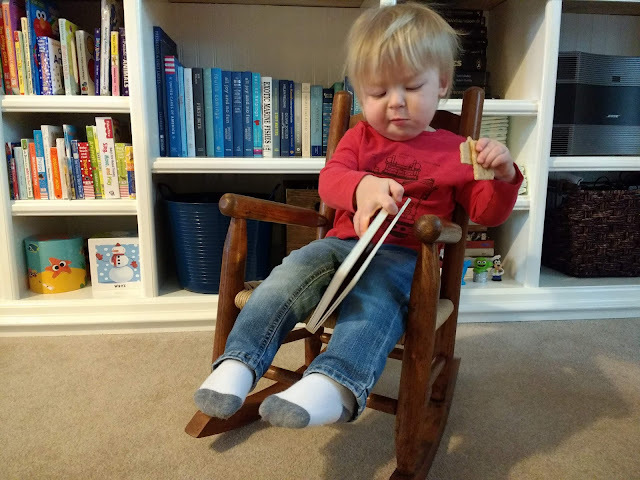 Adam was lucky enough to inherit this sweet, child-size rocking chair from his Grandma. When she moved from her house, one of Adam's uncles insisted he take it before it got thrown away. The seat was broken and it was mighty dirty, but I'm glad Adam could see the potential. It sat in our basement for a long time. But I remembered about it the other day and decided it was time to bring it back to life before Archer and Lyla get too big to use it! The frame was still sturdy, but the seat needed some love. After doing a bit of research, I found out it is called a rush-style seat. I decided I could try my hand at replacing it. Before I could tackle the seat, I needed to clean it up a bit. I cut out what was left of the seat and boy was there a lot of dirt and dust in there! Then I used a bit of water and Murphy's Oil to wipe down the frame. Adam saw that I was working on fixing this up and suggested he restain the frame. The wood was dried out, so a fresh coat of stain was the perfect idea. Adam used some stain he already had on hand to give the frame some new life. 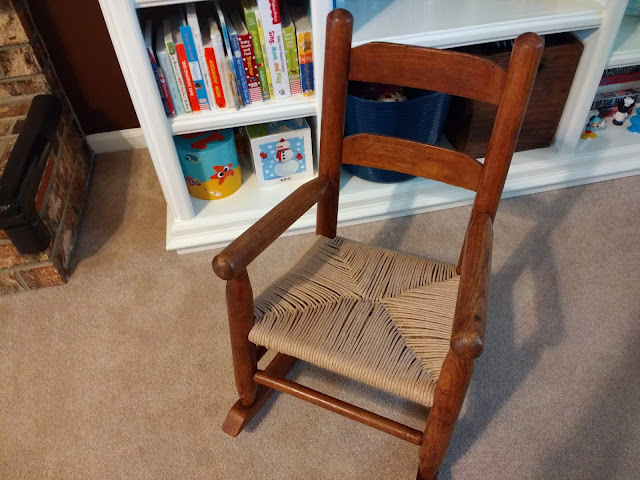 It sure gussied up the chair and left the finish smoother. 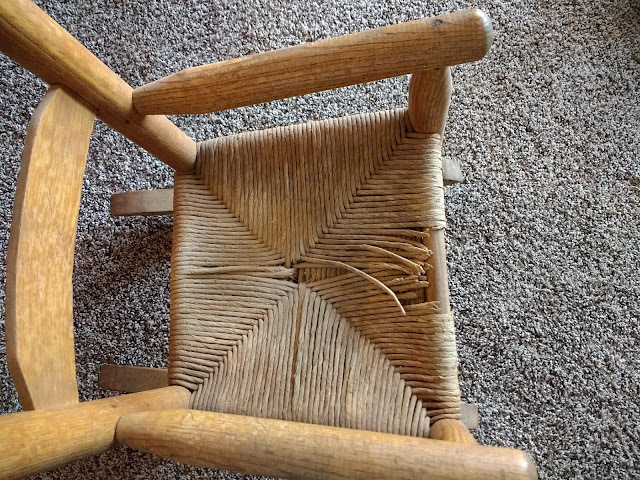 Next, I turned my attention to figuring out how to weave a rush-style seat. This article and this video were super helpful in figuring out what to do. I tried to find some fiber rush at a craft store, but didn't have much luck. I ended up ordering some off Amazon, so I had to wait a bit until it arrived. Don't worry, I wasn't bored while I was waiting for it to arrive. 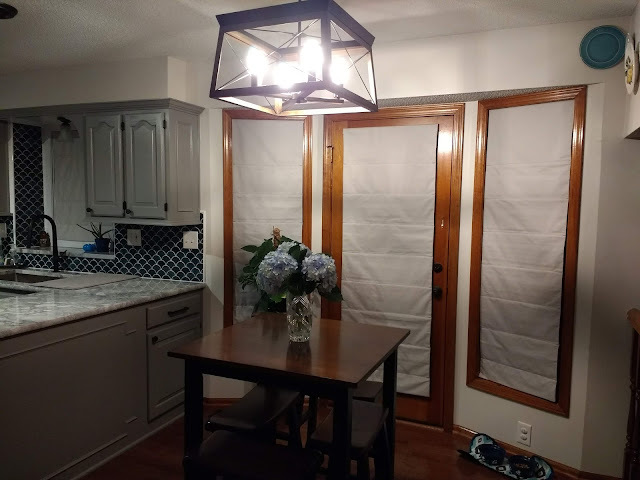 I tackled some Roman shades for the kitchen while I was waiting. But once the fiber rush came, I got to work. The trickiest part was getting started. 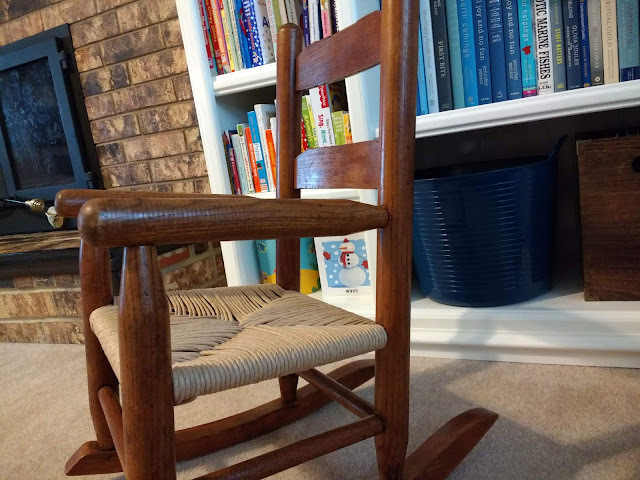 I didn't have all the tools that were recommended, but I didn't want to go buy them since I don't plan to start a chair restoration business. So I had to work with what we had. It was recommended to use a special staple gun to get the first strands attached to the chair. I used a regular staple gun and it didn't work out. So then I tried to use some carpet tacks which were recommended as an alternative. Adam had some in the garage, but they ended up being too big for the small chair. 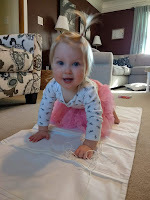 After a trip to Home Depot, I found some smaller carpet tacks (#6 carpet tacks to be exact) and those did the trick. After I got the first strands attached, it wasn't too difficult. 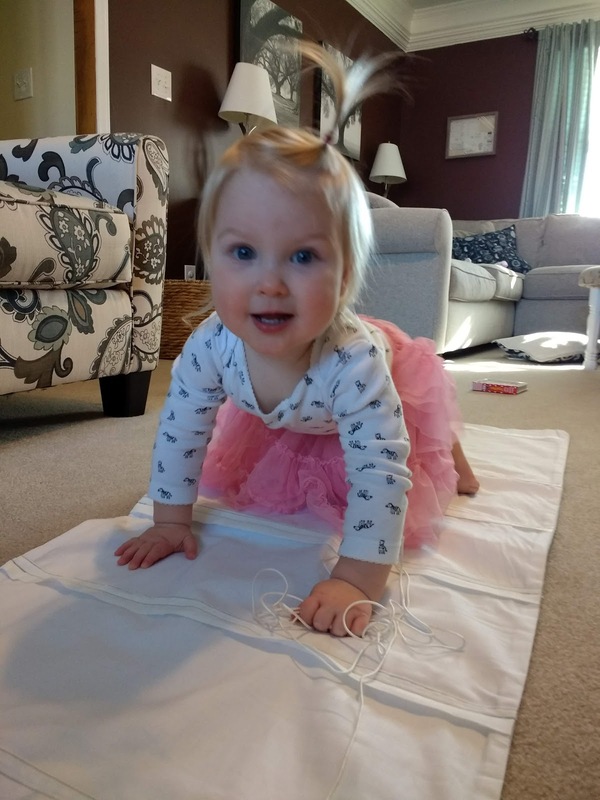 It went pretty quickly and I was able to finish it in an evening after Lyla and Archer went to bed. They must have been tired since they slept through me hammering carpet tacks into the chair! It's certainly not perfect. The man from the video I used as a guide would probably be horrified at all the gaps in the seat. But at least it's functional now. Archer and Lyla seem to enjoy it and find it worthy of fighting over. 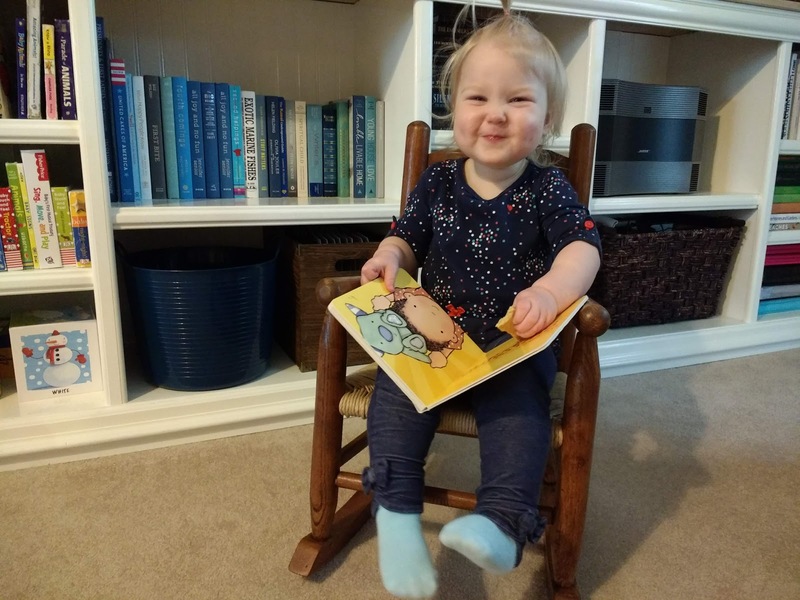 It's pretty special we have this rocking chair from Adam's grandma. And even more special that we have two sweet kids to sit in it. 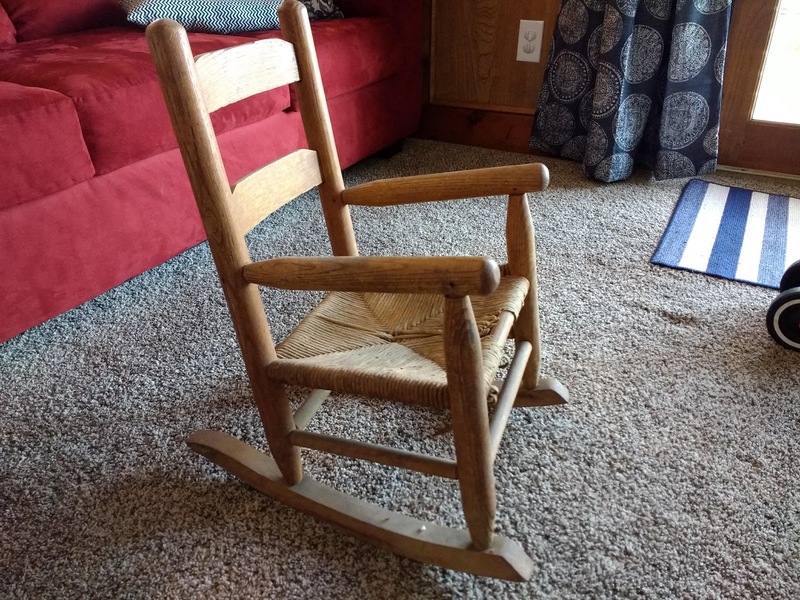 While I definitely don't like hoarding lots of kid stuff, I do appreciate the items that have sentimental meaning like this rocking chair. Who knows? Maybe Archer or Lyla will get to see their kids sitting in it some day. I am very happy to say I can check the last item off our kitchen renovation to do list! The lingering item was to replace the window treatments in the kitchen and eat-in kitchen area. 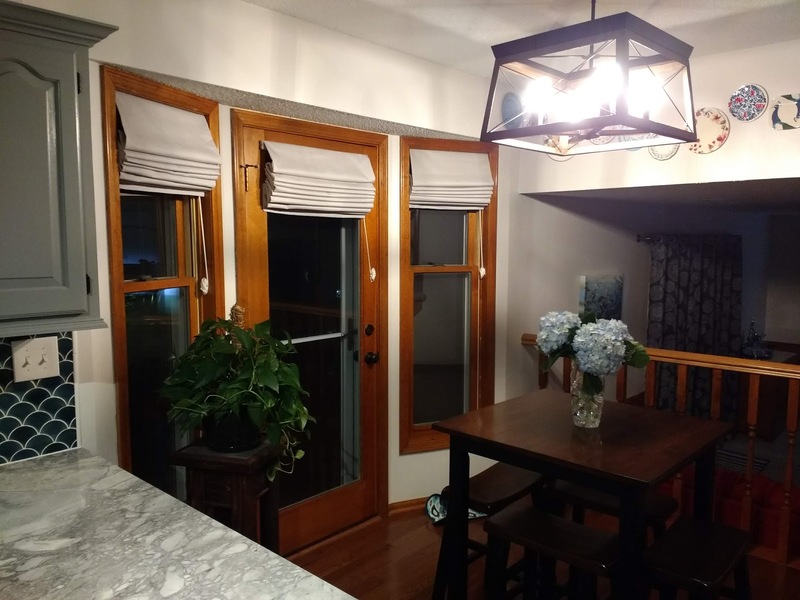 Instead of a bunch of wonky blinds, we now have pretty Roman shades. 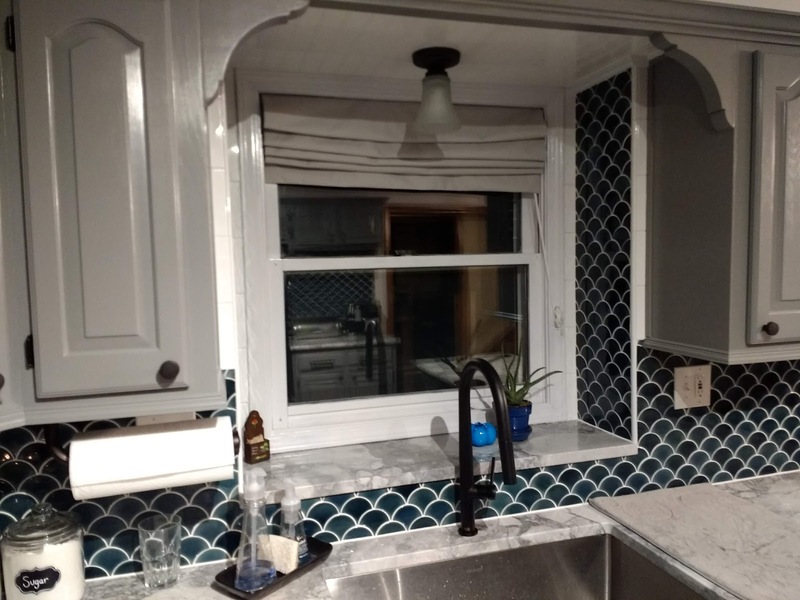 The new Roman shades really help finish off the space without interfering with the bolder parts of the design, like the countertops and backsplash. It took a little while to settle on the idea of Roman shades. 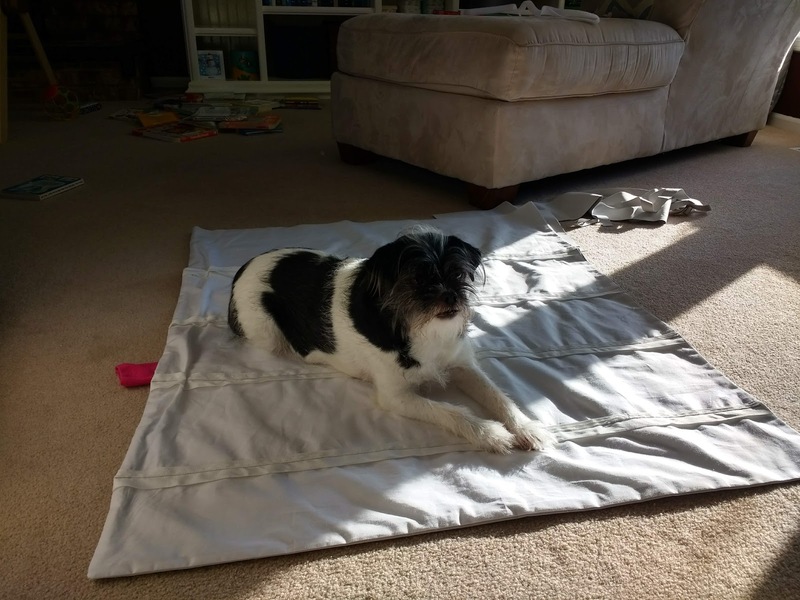 We wanted window treatments that didn't stand out too much and allowed for maximum light to shine through during the daylight hours while also offering privacy during the nighttime hours. We also didn't want anything that Archer and Lyla could mess with. Aside from the previous blinds being old, Archer and Lyla did their fair share of adding to their wonkiness. It was also a pain to have to put the dangling cords out of reach each morning. So I researched lots of different options. We like the look of the bamboo shade we put in our half bathroom. But it is basically see-through at night. Plus we had some non-standard size windows to deal with. 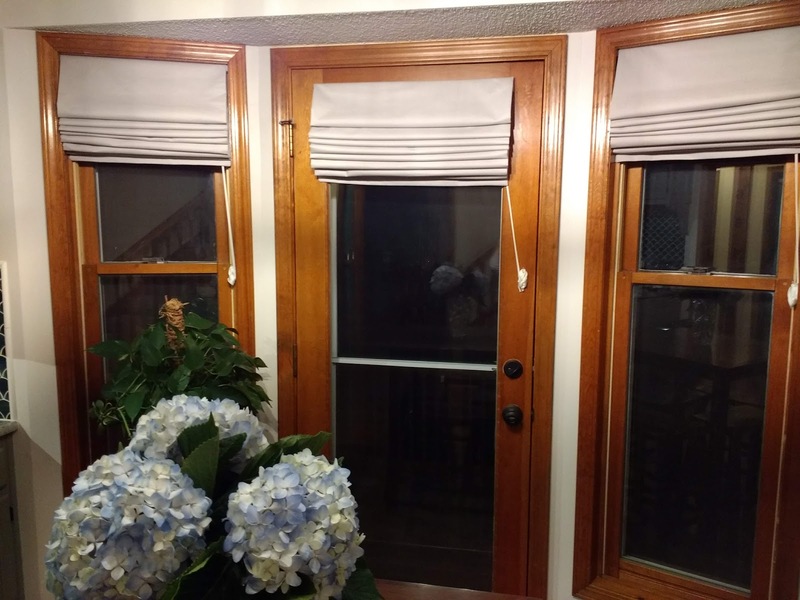 I couldn't really find any off the shelf bamboo shades that would fit our windows. Then I looked into cellular shades, but wasn't sold with the look of them. 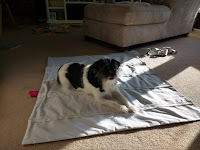 I even thought about using curtains, like we did in our family room. But there just wasn't space for curtain rods and it wouldn't have looked right. So I finally settled on the idea of Roman shades. I liked that the fabric would add some warmth and texture, but fit within the footprint of the window frames. I then started looking online for Roman shades. I ran into the same issue I did with the bamboo shades. I couldn't find what I was looking for in the sizes I needed. So if I wanted Roman shades, I would need to go the custom route. I called one place with "budget" in its name to get a quote. 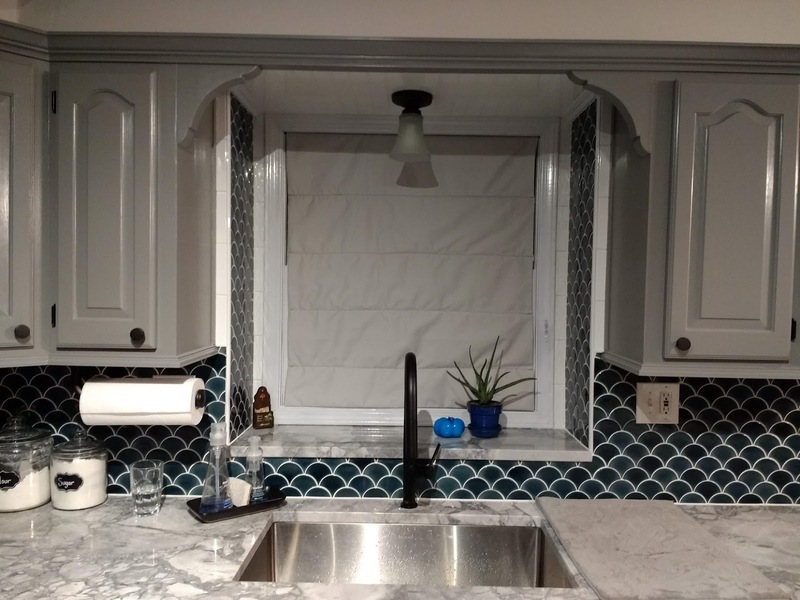 For one Roman shade for one standard size window I was quoted $450! I was shocked! That was definitely not in our budget. So then I decided to look into making them myself. I am not a skilled sewer, by any means. I've made pillows, table runners, and simple curtains, but that's about it. I looked at several tutorials for making them and got a bit daunted by all the steps that were involved. But then I came across this tutorial and started to get a bit more hopeful. 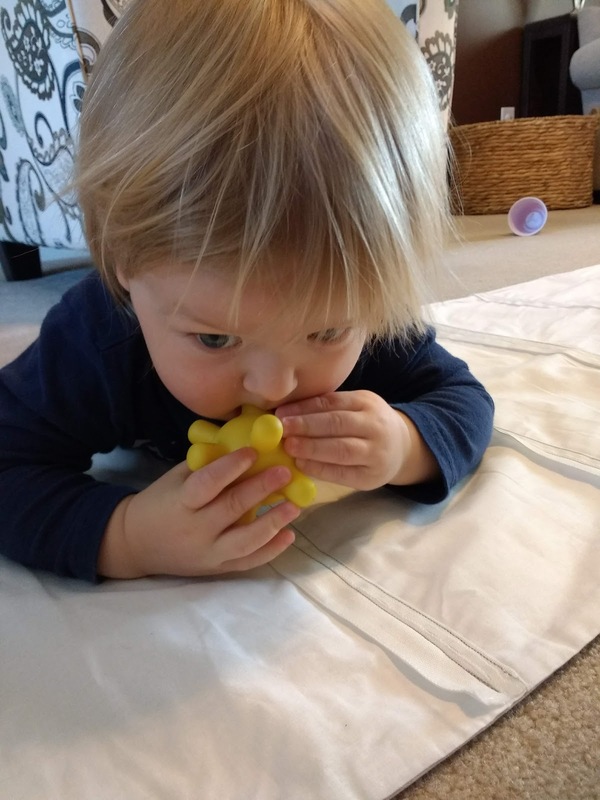 The tutorial was simple to follow and seemed doable. So I decided to just go for it. I went to Hobby Lobby to look for fabric. 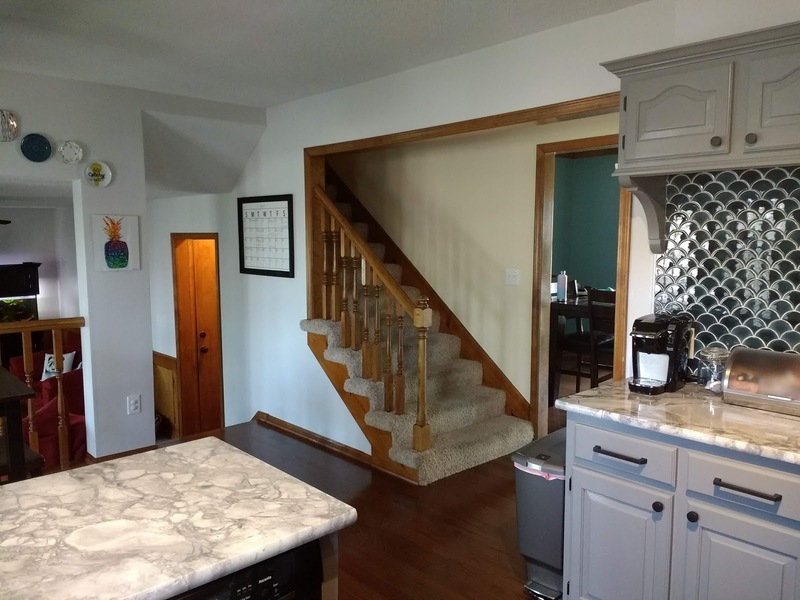 I wanted a neutral gray color that would just sort of blend in with the kitchen. I had one picked out, but happened to come across the clearance fabric before I made it to the cutting counter. I ended up finding one that was a neutral gray, while also being considered blackout and insulating. And the best part was that it was only $7 per yard instead of $20 like the other fabric. I was sold! I got the other supplies I could from the store and ordered what I couldn't find from Amazon. I ended up spending somewhere between $80 and $100 for all the materials. It was a good chunk of money in my book, but a far cry from the $1800+ we would have had to spend if we'd ordered custom Roman shades. Getting the supplies was the easy part. Finding the time to make them was a bit more challenging. I took advantage of nap time and the evening hours after Archer and Lyla went to bed. Adam also took care of the kids during a weekend so I could focus on making the shades. I attempted to work on them while Lyla and Archer were around, but that didn't work out so well. They did, along with Jazzy, seem to approve of my work. They also added their own touch with some graham cracker crumbs and dog hair. The tutorial was excellent and I got better with each shade I made. I started with the shade over the sink since it was all by its lonesome. I wanted the other three to look as close to identical as I could since they would be right next to each other. It was a good thing too! The first one turned out much like the first pancake turns out. But I tweaked a few things on the tutorial to make it easier on myself and the last three looked much better. They are nowhere near perfect, but I'm pretty proud of how they turned out. I won't mind admitting I made them if someone asks where I got them. I like that our kitchen renovation is a mix of both professional work and DIY. The fact that I can look at the cabinets knowing Adam added all the trim work, look at the light fixture knowing Adam and I installed it together, and look at the Roman shades knowing I made them makes me love our kitchen even more.